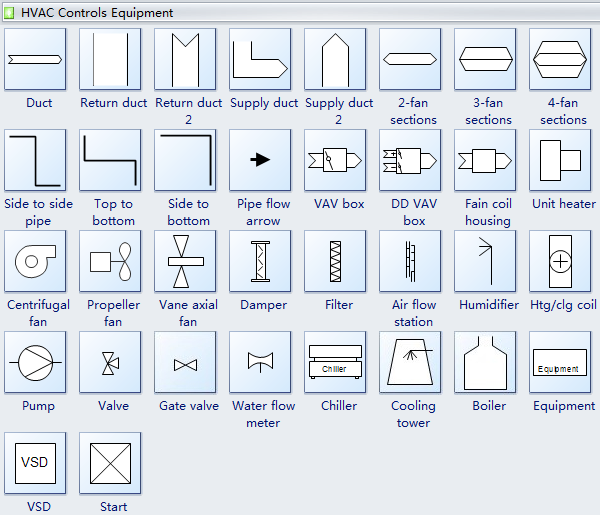 Standard HVAC plan symbols represent duct, pipe, VAV box, unit heater, propeller fan, etc. 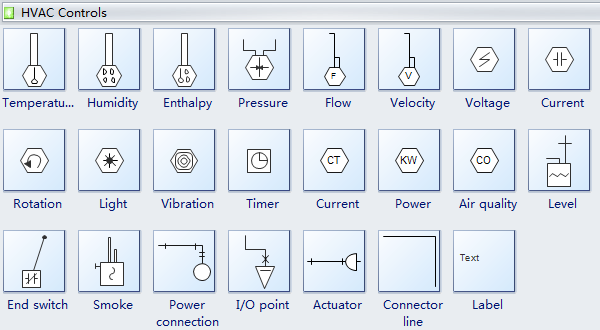 These symbols help create accurate HVAC electrical diagrams and documentation. Edraw floor plan software offers you plenty of special shapes to better make HVAC plans, duct, pipe, VAV box, unit heater, propeller fandamper, filter, centrifugal fan, propeller fan, air flow station, humidifier, pump, valve, gate valve, water flow, chiller, cooling, boiler, etc. 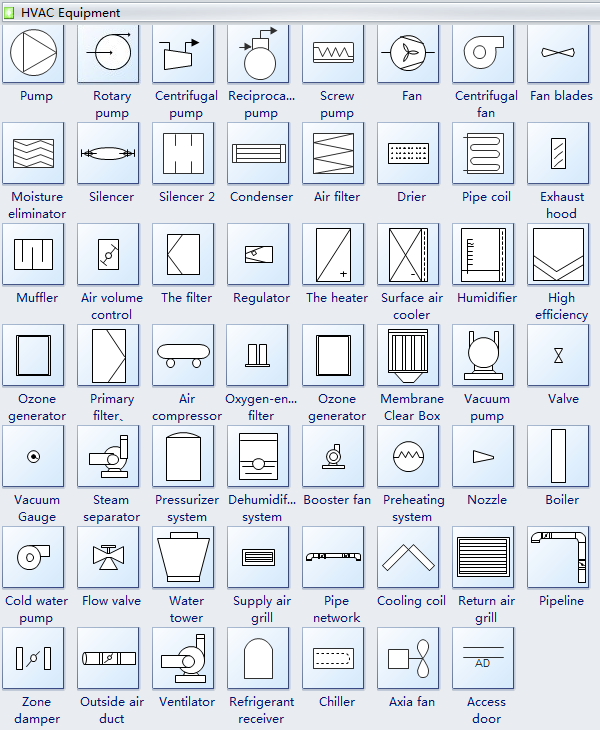 The following HVAC equipment symbols show pump, filter, silencer, valve, compressor, muffler, etc. Pump is a mechanical device using suction or pressure to raise or move liquids, compress gases, or force air into inflatable objects such as tyres. Silencer is a device fixed to the exhaust of a motor vehicle to reduce engine noise. Condenser is an apparatus or container for condensing vapour. Drier is a kind of substance or machine to make things dry quickly. Muffler is a device used to deaden the sound of an instrument. Filter is a porous device for removing impurities or solid particles from a liquid or gas passed through it. Nozzle is a cylindrical or round spout at the end of a pipe, hose, or tube used to control a jet of gas or liquid. Pipeline is a long pipe, typically underground, for conveying oil, gas, etc. Chiller is a machine for cooling something, especially a cold cabinet or refrigerator for keeping stored food a few degrees above freezing point. 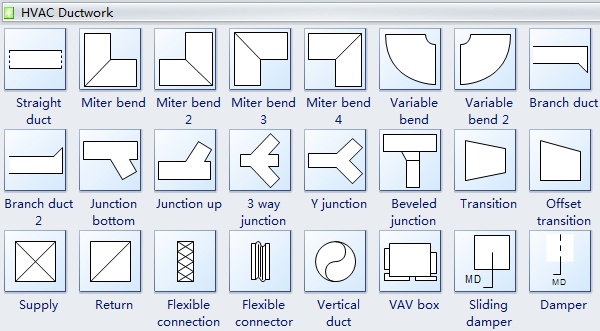 The following HVAC ductwork symbols show the different ductworks and junction such as straight duct, miter bend, miter bend, 3 way junction, Y junction and transition. Bend is a curve in a road, river, path, or racing circuit. Y junction generally has 2 arms of equal size. Transition is the process or a period of changing from one state or condition to another. VAV box is short for Variable Air Volume box. The following HVAC controls symbols include common used temperature symbols, flow, velocity, voltage, current, light, timer, power and more. Temperature is a kind of device to measure temperature. Humidity is kind of device to measure humidity. Timer is a device to measure time. Air quality is a device to meaure air quality. The following HVAC controls equipment symbols include duct, sections, pipe, vav box, heater, damper, boiler and more. Duct is a tube or passageway in a building or machine for air, liquid, cables, etc. Damper is a kind of device that has a subduing or inhibiting effect. Learn HVAC plan design guide here. Need fresh looking HVAC plan symbols for your design? These HVAC plan symbols are a cinch to pop in. And their crisp, fine detail will make spectacular, easy-to-understand diagrams and presentations to your customers.